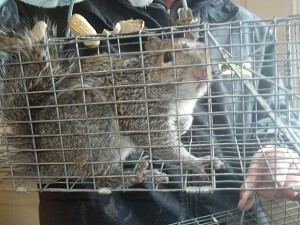 An animal on your business or property can simply wreak havoc. If you want a humane, dependable solution, live animal traps may be the answer. Swallows, woodpeckers, and other birds as well as squirrels and similar varmints can be captured and safely released far from where they can do any damage again. Depending on the species you’re addressing, our professionals have a number of effective methods to employ. For example, larger creatures such as raccoons and armadillos call for larger live animal traps that must be set up and used properly to avoid capturing pets or harming any critters. We’ll also make sure any offspring are removed from your property. Relying on our decades of experience, you may prevent animals from settling on your property before you ever have to employ nets or cages. Using our animal exclusion techniques, our specialists will examine your home or workplace for any areas that may attract or permit unwelcome guests. We’ll then consult with you on your options – which may include screening, sealing holes, and clearing debris. We’ve provided peace of mind for our clients since 1982. If an animal has found its way to your property, there’s a lot at stake, from curb appeal to long-term damages or lost customers. Contact our team to capture and remove these visitors and prevent them from checking in again.